The Glitzkoin And GTN snapshot is an infographic more than a pretty picture. Growing to be one of the widely shared image in the crypto community, the snapshot delivers facts and figures, at a glance. Many crypto enthusiasts have requested, for a more detailed interpretation of the information shown in the snapshot. The Glitzkoin ICO was well received by the crypto world, it was successfully completed in June 2018. The ICO price for the GTN token was pegged at $0.20. This was neither too high nor too cheap, the objective was to attract wide participation. Results prove that, the price played its role perfectly. The project moved to the development phase immediately after the ICO completion. Two major components, the DPE (Diamond Price Estimator) and DiaEx (Diamond Exchange), rolled into production. 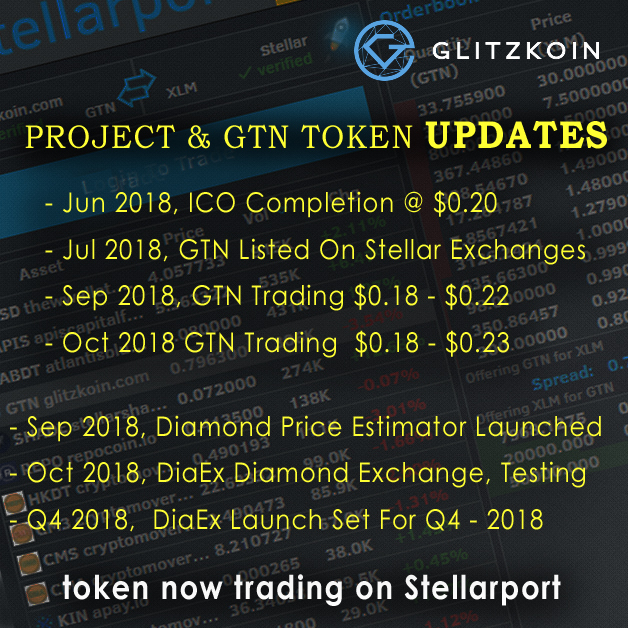 Since the Glitzkoin project is based on Stellar blockchain resources, the token was verified by Stellar and listed on its exchanges in July 2018. Supported by an active band of seasoned crypto traders, the GTN token has maintained an impressive trading price, in the $0.18 to $0.23 range. Impressive indeed if you consider the fact that, most cryptos launched during the same period, are at present trading around 50% to 80% BELOW, their ICO price. The GTN token price has consistently maintained a healthy rate, through Sep – Oct 2018. The range across the two months remains at $0.18 to $0.23. September 2018 saw the launch of the diamond industry’s most comprehensive, diamond price estimator – DPE. Using complex algorithms to process, mounds of data from global diamond markets, the application determines the market price of a specific diamond. Delivering an accuracy of +/- 20%, the DPE is available for general use at no charge. Diamond buyers and sellers quickly grasped the utility of the application, the tool attracts a number of users each day. Users of the diamond price estimator, are not obliged to trade on the DiaEx diamond exchange. The superstar of the Glitzkoin project is undoubtedly, the DiaEx diamond exchange that features a comprehensive diamond trading platform. The diamond exchange is designed to support B2C and B2B trade in diamonds. Now in the testing phase, the exchange is scheduled for a complete launch in the fourth quarter of 2018. The DiaEx platform is configured to accept the GTN token as the mode of payment. The diamond industry eagerly awaits the crypto as it gives them a chance to spurn, the cumbersome and expensive banking system. While most blockchain projects are conceived by technical geniuses, Glitzkoin was conceptualized based on the vision of a diamond veteran. The entire project and all its components, are focused on improving the efficiency and profitability of the glittering industry. The fact that the project is directly related to a real world business and that, the GTN crypto token has a strategic role to play – has attracted the attention of experienced crypto traders. The crypto community continues to actively support the Glitzkoin vision. This is the prime reason why the GTN, token has maintained an impressive price range even as, the project goes through the development phase. Diamond traders have for decades, had to put up with time consuming and expensive, banking services. They now look forward to using a crypto token to settle payments on the trading platform. Much of the diamond trade occurs across international borders, this brings in the complexity and costs of handling multiple currencies and their conversion. Using a crypto currency will put an end to the hassles related to multiple currencies. While the multibillion dollar trade in diamonds might sound awesome, the fact is that the industry has been showing signs of stagnation for the past few years. Some of the prominent features of the Glitzkoin project are aimed at improving market sentiment. It is only certified diamonds that are listed on the DiaEx diamond exchange. This provides an unbiased and accurate, description of the 4C parameters for each diamond. The possibility of trading in fake or synthetic diamonds on the Glitzkoin platform is also eliminated. Conventional diamond trade is dominated by middlemen and brokers. These entities add to the price of the stone without, delivering any added value. The DiaEx enables buyers and sellers to interact directly with the platform, no middlemen, no price inflation and no price cloaking. The objective of periodically releasing, the Glitzkoin project snapshot is to provide a quick update of what is happening. While the image is very handy and easy to share and repost, a significant number of crypto enthusiasts, prefer to have more details – that is precisely what this report does. You can review the performance of the GTN token on the link provided below.